Sending an autoresponder email right after the user submits the form may not always be the right way for you. You may want to notify your users at a later date. If for example, you have a hotel booking form, you can notify your form's respondents 1 day before their check-in date with this function. 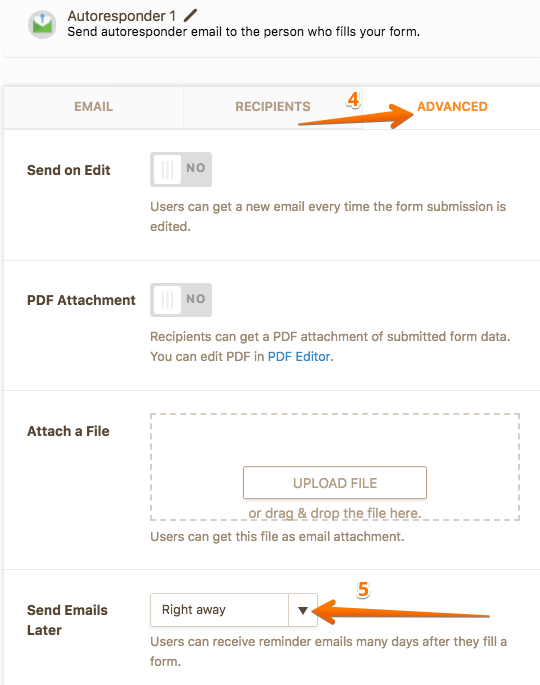 To set up the Send Emails Later function: Click on SETTINGS at the top of your form builder's screen. At the left section of the screen, click on EMAILS. Upon hovering over the Autoresponder, a pencil icon will appear. Click on it to open the settings of your Autoresponder. After opening the settings of your Autoresponder, simply click the ADVANCED tab. There, you will see the Send Emails Later option. There are many options to choose from the dropdown list in order to decide when you would like your emails to be sent. Right away: This is the default option, autoresponder emails are sent right after the submission is received. 7 Days: Email is sent 7 days after the submission date. 14 Days: Email is sent 14 days after the submission date. On a later date: After clicking this option, you can choose your preferred date of email to be sent from the opening date field. checkin/notifydate: These are the date fields that appear in the demo form I have prepared for this guide. By choosing them, your form's respondents can specify the date they would like to receive the email. If you have another date field on your form, it will also appear on your "Send Emails Later" dropdown list. 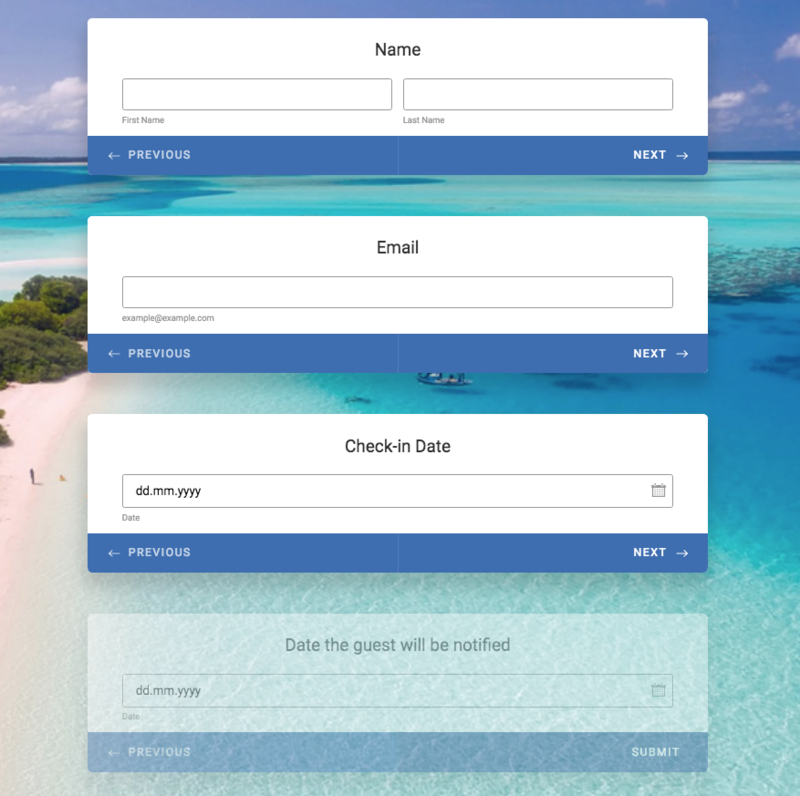 So let's see this function in action taking the example mentioned above, let's say we have a hotel booking form and we would like to notify our guests about their check-in date, one day before the day they will check-in. In order to do it first, we need to create a simple booking form as seen below. There are two date fields on this form. Check-in Date: This field is for the user to enter their desired check-in date. Date the guest will be Notified: Field that we will use in our send emails later option. It is set as hidden. 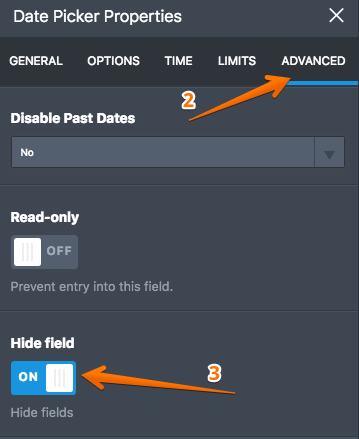 Users will not be able to see this field, and we will set this field's date as check-in date -1 by utilizing the "Conditions" feature of JotForm. First, let's start by making the "Date the guest will be notified" field hidden. 1) Click the field, and click the GEAR icon next to it. 2) In the Date Picker Properties section, click on ADVANCED. 3) Click the "OFF" button below Hide field to make it "ON". Now as the notify date field has been set as hidden, users will not be able to see it when they are filling up the form. We will now use conditions to set the notify date as the day before the check-in date. 1) On your form builder screen, click SETTINGS at the top. 2) Select CONDITIONS from the left panel. 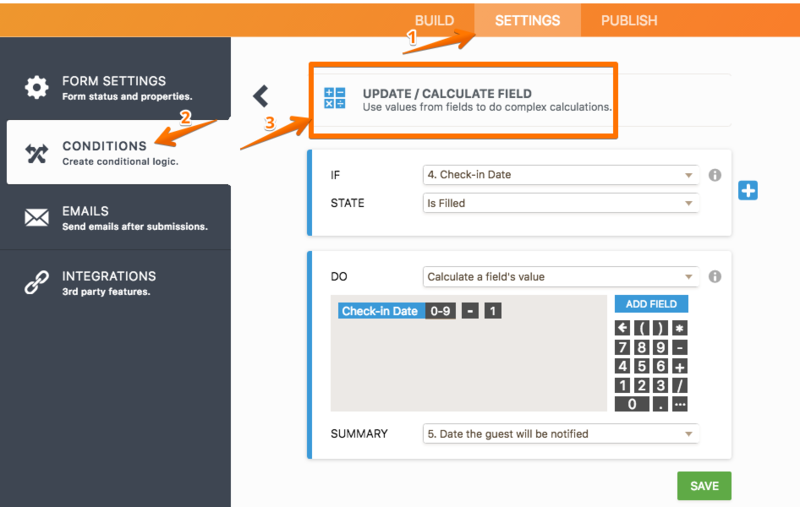 3) There will be a list of condition types to select from, choose UPDATE/CALCULATE FIELD. If the check-in date(user chooses the date) is filled, the Date the guest will be notified field is calculated and filled as Check-in Date - 1. You can set different conditions like check-in date -7 if you would like to notify your customers one week before their check-in date. After you set your condition, don't forget to click the SAVE button. Now that the condition is set, all we have to do is to set Send Emails Later as Date the guest will be notified field. There are two autoresponders set in the demo form, one of them sends an email right away, and the other one will be sent a day before the date user chose at the check-in date. You can also check the "Spice up your email campaigns" guide to see another use case of the send emails later function. How do you plan to utilize the send emails later function of the JotForm? If you have any comments or suggestions, do not hesitate to leave it below. You can reach us 24/7 through our Support Forum if you have any question. How to send an automated email response on a specific date? How can I send emails one week before an event starts?